As a title, yes it is apt given recent events. 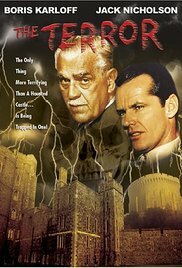 But no, this is the 1963 movie with Boris Karloff and Jack Nicholson. A young cavalry officer is lost on a beach (Nicholson), and follows an attractive (read, bosomy brunette) woman. So far, there's been a lot of screeching strings, trying to build tension. Not sure it's worked, but eh. Our hero follows her into the water, is attacked by birds, and has just awakened in a castle while being looked after by an old crone. [tick and tick]. Our attractive woman has reappeared and we've just found out she's possessed. I also like that Nicholson's inability to act came from the start, the character is always Nicholson. He's now met a Baron and questioning him about the young woman, who the Baron assures him doesn't exist. "for a ghost, she's a very active woman"
Oh more ticks, graveyard castle, puffy shirts, and the baroness (cute babe) is still dead. But oddly active. Jack's acting is still wooden, but he's challenging people. There's also an Eric. Yeah, Im confused too, but my bagel was nice. The Baron is getting an earful from Jack, for exposition purposes. The servant is very suspicious, followed by a lot of wandering around the castle by Jack. It's not riveting stuff by any stretch. Honestly, the football is better... In a predictable plot twist, Jack's trying it on with the ghost. My money's on her succumbing....I was right, wonder what I win? There's an awful lot of misty graveyard shots in this, and yet it's not a hammer horror. My mind, figuratively blown. The old crone appears to be controlling everything. "mesmerism, you fool" yes, it's scintillating stuff. The soundtrack would make old Korngold happy, but it's by some dude Ronald Stein, who composed for a large number of b-grades I've seen. Classy. Viewing has been brought to you by Beavertown Bloody 'ell, and Brewdog Black Hammer. Both highly recommended. Far more than the movie.